Green smoothies have been a part of Allyson Straka’s life for more than a decade. The single mom and certified holistic health coach drinks at least one green smoothie a day in her effort to eat clean, natural, nutrient-dense, healthy foods. Her advice to anyone who wants to improve their health is to do the same. 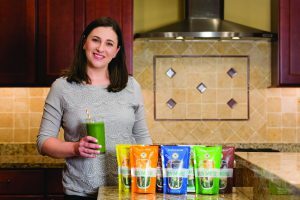 Now this entrepreneur is looking to make it more convenient for people to do just that through her company The Frozen Garden in Valparaiso, which specializes in 100-percent natural, locally sourced when possible, frozen fruit and vegetable smoothies, and in 2019, other similarly focused products. Straka said she listened to her clients complain about not having the time to make fresh smoothies or watching the ingredients spoil in the fridge. She initially began making a frozen smoothie mix for her clients, and in 2016, began selling the smoothie mixes from the mini-fridge in her studio, and then online. Making healthy smoothies with local organic fruits and vegetables a convenient choice became Straka’s focus. The chief smoothie officer tested flavors in her kitchen with a simple $20 blender. A network of local farmers in northern Indiana and southwestern Michigan have been tapped to provide the freshest fruits and vegetables. “That was our big thing, to be able to support local farmers,” Straka said. Frozen Garden smoothies rely on the flavor of the fruits and vegetables. Produce is flash frozen as soon as it is received. In many cases, that is the same day the fruits or vegetables are harvested. The only additional flavors in the smoothie blends come from seeds and spices. There are zero added sugars or flavorings, she said. Flash freezing right after harvest captures the most flavorful fruit in season and locks in the nutrients, which begin diminishing once the produce is harvested. Along with cultivating a network of farmers, Straka said she had to find her way onto store shelves. The first grocery stores to carry Frozen Garden smoothies was Strack & Van Til, she said. Mike Nisevich, sales manager for Highland-based Strack & Van Til, said Frozen Garden’s mission mirrored that of the grocer’s. “We call out we are Indiana made. (With Frozen Garden) we saw an opportunity to take an item still in its infancy and partner with that local business,” Nisevich said. Strack & Van Til gave Frozen Garden needed exposure for their produce while providing a few insights into distributers who could carry the product. “They fulfill a niche for people looking for some healthy alternatives,” he said. Straka said the relationship with Strack & Van Til helped them connect with Midwestern distributor Dutch Farms. Now she has two national distributors helping place Frozen Garden smoothies on store shelves. A little more than two years after selling her first smoothie in her studio, Frozen Garden smoothies can be found in more than 100 grocery stores in the Midwest, New England and Mid-Atlantic regions. She attributes the success of her company to hard work and sticking to what she believes. Straka said more and more consumers want to know from where their food comes and from what it is made. Health-conscious consumers are swapping out processed, chemical-laden food products for organic, whole foods. While the company is profitable on the retail side of things, Straka said it will take a little longer to reach the black on the wholesale side. She expects wholesale profitability in 2019. Click here to read more from the Feb-Mar 2019 issue of Northwest Indiana Business Magazine.